I've gone back and forth on the Wal-Mart debate, musing over the impact Wal-Mart has on the local and global economy, and am comfortably at a point where I can say that I'm ok with the presence of a Wal-Mart nearby. I previously was opposed to Wal-Mart, on account of the crushing-of-small-businesses that tends to occur, as well as the squeeze-technique Wal-Mart uses against suppliers (Vlasic's $2.97 gallon of pickles, for example), but after long chats with my capitalist friend Lyquoc, my opinion has started to change. The fact that I have my own small business (my welded figurines) plays a large part of my current opinion. Ultimately, if Wal-Mart wanted to compete against me by waging a price war, I'd lose. If Wal-Mart could crank out little 6-inch welded figurines for $3 a piece against my $10, I'd be tempted to quit making welded figurines all together. I couldn't compete on price -- for $3 a figurine, it wouldn't be worth my time. However, I'm custom making these figurines with less than a week turn-around time, which is something Wal-Mart can't effectively do. Wal-Mart excels at selling items of mass-production; custom items just aren't in the scope. In that regard, I have a distinct competitive advantage over Wal-Mart for my particular market. The lesson? Don't fight against Wal-Mart on price. If you're a small or large business and want to stay around, provide something that Wal-Mart doesn't. Find a niche market and sell something that Wal-Mart can't or won't. All that aside, Wal-Mart recently decided to start selling generic prescriptions for $4. I'm glad I'm not in the generic prescription drug business. And as I think of the overall impact that this move could have on the health care proble in America, I have to say that I'm pleased. The biggest beneficiaries of the $4 drugs, previously priced 30 percent to 60 percent higher, will be uninsured consumers and patients who are caught in the "doughnut hole," or Medicare recipients who have fallen into the coverage gap for Part D prescription plans, said Mike Adloo, Wal-Mart's regional pharmacy manager. "No one program, no one company ... can solve the country's health care problems, but this is going to be a big help for a lot of people," Adloo said. 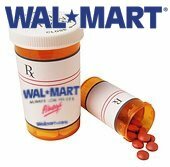 When Wal-Mart brings this program to Washington, my family will be one that sees a 60% decrease in our prescription drug purchases. Very good news. It's interesting to note that Walgreens, a local pharmacy retailer in my area, states that they will not lower their prices; Target, on the other hand, is matching Wal-Mart's price in states where Wal-Mart has rolled out the discount. It'll be entertaining to see who wins out in the retail pharmacy market, because in the end, it'll be the consumer who benefits the most. Wasn't it about 8 years ago, naaaw must've been more like twelve years ago a group of mom and pop pharmacies in Pennsylvania won a judgement againt Wally because Wally was pulling prescriptions by offering them below cost in towns until the neighborhood pharmacy went under then they jacked the rates back up when the competition failed? Some can argue (and credibly IMHO) that this is what you do in the business world- if you have an advantage you exploit it. Personally I do not condone such a thing- it is small business that sponsors the little league team or the Scouts- the companies are a community member not solely an employer. I have seen Walmart play local communities against another for initial stores (tax dollars) and then ten years later they again relocate to gain another few years of tax deferral from the city they "award" the privilege of being in. there are a lot of Walton family members in Forbes top ten richest Americans- the money ends up in their pockets while the number of full time employees remains low. I think you will find that in the long run those prescriptions for 4$ are going to cost a lot more for everyone.